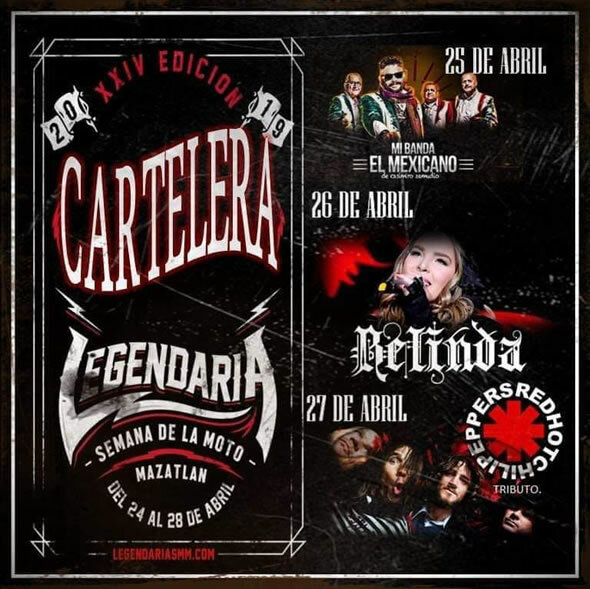 Next Friday 26 April we look forward to seeing you in the Plaza de la Moto for you to enjoy the second concert of the Legendary Motorcycle Week Mazatlan 2019 that will be in charge of Belinda. From the 24 to 28 April, Mazatlan will be roaring with the twenty-fourth edition of the Legendary Motorcycle Week 2019, which, as in previous years, will offer to its participants an attractive program of activities like beach competitions, concerts, rural tours, races, custom motorcycle competitions, the traditional grand parade through the Mazatlan’s levee and much more. Sign up and be part of one of the most important motorcycle events in Mexico. We look forward to seeing you in the International Motorcycle Week Mazatlan 2019!